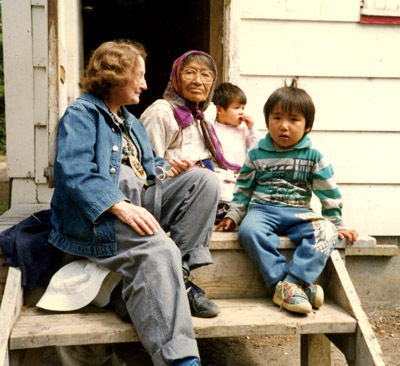 Mary Black Rogers, an anthropologist and ethnohistorian from Minnesota who studied the culture and history of Ojibwe and Métis communities in Canada and the United States, died in Vancouver, British Columbia, on January 27, 2011. In 1960 she enrolled in graduate program in Anthropology at Stanford University, where she was a student of anthropologists Joseph H. Greenberg, George D. Spindler, and Paul Kay. Four years later she started her fieldwork among the Red Lake Ojibwe at Ponemah, Minnesota. In 1967 she completed her dissertation, “An Ethnoscience Investigation of Ojibwa Ontology and World View,” (authored under the name Mary B. Black) a study of the Ojibwe language and the way in which Ojibwe speakers classified the natural and human worlds, as reflected in their rich language. She described the way in which the Ojibwe saw the world around them as animate, including trees, plants, rocks, and other natural features that other cultures saw as mute, lifeless, and inanimate. Dan always operated from the true center of “his Indian way,” whether dealing with his own people or outsiders. His distinctiveness emanated from the very centrality of the role he sustained, central to what remained of the traditional culture. This was the essence of the complex identity he imparted. Mary also wrote about Dan Raincloud’s knowledge and about his sense of humor. She said that Raincloud had initially given her an Ojibwe nickname that he said meant “I wonder why.” It was a reflection not only of her anthropological calling, but also of the curiosity that many others who knew her saw also. Mary was inspired by the previous work of the anthropologist A. Irving Hallowell, who had learned through his studies that the Ojbwa on the Berens River in Manitoba made no distinction between “natural” and “supernatural.” Ojibwe people believed, he wrote, that they obtained many of their abilities from powerful non-human beings, or spirits. Black-Rogers noted that her research at Red Lake strongly supported this idea. She wrote that the people there did not separate “special” or “magical” powers from “those which are requisite for everyday living.” Instead they included within everyday skills, “the abilities for which they must depend on non-human beings.” She wrote: “There seems to be a continuous spectrum of powers, going down to the most mundane, which are receivable from some non-human source and which are not inherent in human beings.” Such abilities might include the success at hunting, or designing and making beadwork for which a human beings needed to show gratitude for their success. At the other end of the spectrum would be things completely beyond “natural human abilities.” Both ends of the spectrum involved “supernatural” involvement; the difference was merely one of degree. In later years, Mary applied her understandings of the way the Ojibwe at Red Lake viewed the world to analyzing the history and culture of the Ojibwe people in the past, as it was recorded in historical documents. Her influential 1985 paper, later published as “Varieties of ‘Starving’: Semantics and Survival in the Subarctic Fur Trade,” showed how an understanding of Ojibwe semantics could explain the way Ojibwe people interacted with fur traders, in complex exchanges. English words such as “starvation” or “starving”—when used by traders to describe the condition of Indian people who came to their trading posts—had much more complex Ojibwe nuances than apparent to people today or even to traders in the past. After completing her graduate studies, Mary was hired by the anthropologist Edward S. Rogers, curator of ethnology at the Royal Ontario Museum in Toronto, to work with him in a study of the history and culture of the Weagamow Lake (or Round Lake) Ojibwa-Cree First Nation in northern Ontario, near the Manitoba border. Subsequently she married Rogers. In their work together at Weagamow Lake, Ed and Mary developed a close relationship with the community. Mary was adopted by the elder Mamie Quequish to replace a child who had died fifty years before. Ed and Mary left Weagamow Lake for Burlington, Ontario, in 1975, but continued to have contact with the community. After his death in 1988, Edward Rogers was buried at Weagamow Lake with the permission of the community. His gravestone described him as a “Weagamow Friend.” Mary returned to the community for the burial and again in 1991 and 1994. She also received visits from community members in Burlington. In late September, another visit to my husband’s grave was very rewarding. By bush plane north from Sioux Lookout to Weagamow Lake, Ontario, in whose cemetery he was honored to be buried in 1988, by the northern Ojibwa/ Cree people we had known for so long. It was joyful to see so many old friends and adopted family. This year it coincided with their annual feast which culminates a week of hunting and cooking in the old ways. These ways have not disappeared altogether, but the youngest echelon of Weagomow people had never seen it full-blown. This was for me a time of mourning, and also of renewal. I was happy to be able to take the trip, though it was a bit more tiring than I recall from the past. Like her husband, Mary was interested not only the current culture but in the history of Weagamow community, many of whose members had descended from a man known as Ojicak, or Crane, in the 18th century. As a result, the community was mentioned in records of the Hudson Bay Company and governmental agencies as “The Cranes.” Mary continued to do research on “The Cranes,” in the years after returning from Weagamow, presenting her findings in articles and at conferences. In the 1980s Mary became interested in studying the history of the people of mixed European-Native marriages, sometimes called Métis. Her interest stemmed not only from her anthropological work but also from her own ancestry. Her mother Stella LaVallee was the granddaughter of Antoine Pepin, a trader and blacksmith who lived in the Coldwater Spring area near Fort Snelling in the 1830s, later moving to Little Canada, north of St. Paul. For Mary, studying the history of people like Antoine Pepin was a “Roots” project, a link between her own family history and the broader sweep of events. Though they had long careers in the fur trade that took them across the Great Lakes and northwestern Canada, they founded local communities in Minnesota and Canada and were intermediaries socially and culturally in the fur trade and in settlement times, She saw the potential in telling a broad history through the “life histories” of particular families, which she believed would demonstrate the broad patterns in the development of the Métis people. In her later years Mary engaged in extensive research on Métis communities, presenting her ideas in conference papers and in an extensive correspondence with colleagues and Métis descendants. Her letters were as full of detail as her notes and papers, reporting her lastest finds and her newest ideas. Though she never completed her study of Pepin and other Métis, her ongoing work in showing how the large picture of Métis history could be told through individual and family histories has inspired many others to undertake such research. I have observed children enjoying a story immensely even when large portions remain beyond their understanding. They apparently can accept those parts, like so much in their daily experience, rest upon knowledge yet to be attained, contain clues to a future unraveling of the mystery of life—the still largely mysterious life of the adults around them. The readers of this book will receive some outside help in western-culture style, since the authors have generously provided explanatory keys to the Ojibwa doors to life. But please, dear reader, don’t cheat and look at the ethnographic sections first. Be like the child of the culture, or at least like the ethnographer—trust that the meaning is there; proceed as thought the only way to find it is the hard way—by living, and wondering. When I read these words they were inspirational, but I did not understand the extent to which they came from a complex, nuanced mind, one capable of extremely detailed analysis of culture and history. In 1984 my friend John Fierst and I both had research to do at the Hudson Bay Company Archives in Winnipeg, where Ed and Mary were working on The Cranes, the people of Weagamow Lake. They seemed as eager to know about our research as they were in telling us about theirs. We had several good meals with them, (at Ed’s expense, I think) and had a delightful time. Because Mary was working on her Roots research, relating to Minnesota history, I often saw her and corresponded with her in the following years. Like many others, I soon became the recipient of long, richly detailed letters, full of information, ideas, and an amazing energy that came from someone who in person gave the misleading impression of being frail. After Ed’s death she started to spend part of the year in Minneapolis for research at the Minnesota History Center in St. Paul. She and I often went to lunch at It’s Greek to Me, or any other Greek restaurant that might happen to be nearby. The last time I saw her was in 2007, when she came to the launch party for my book and we had lunch at Christo’s. Now I wish that I could talk with her again, but reading her articles, her rich letters, I feel again the inspiration of her energy, her knowledge, and her understanding. Even though she is gone, our conversations with Mary and her ideas will continue. 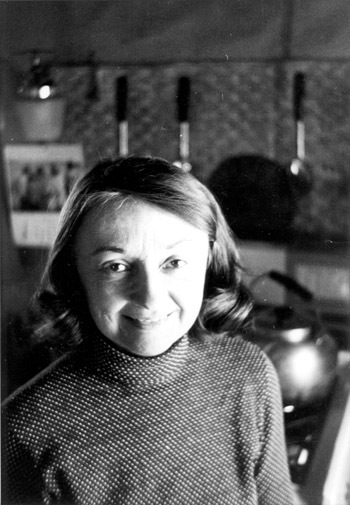 Those interested in reading some of Mary’s many published essays and articles should know that during her professional career her work was published under several names. Her first work was published under the name Mary Bartholomew Black or Mary B. Black. Later on, after her marriage to Edward Rogers her name was usually given as Mary Black-Rogers or Mary Black Rogers, without the hyphen. Eventually I hope to put together a more complete bibliography. For now, most of her essay on her adoption at Weagamow Lake can be read online at Google books. Thank you, Bruce, for such a detailed account of my aunt’s life! I appreciate it very much. For many years Mary was a kindly guide to this amateur historian, always willing to gently nudge another toward a deeper insight about the people she knew so well. Native peoples and scholars will miss her. Thank you, Bruce, for your wonderful remembrance of my sister, Mary Black Rogers. She was also a perfect big sister, letting me tag along on her adventures, reading me her love letters from Alan Black, and playing hooky from Sunday School with me at which time we would sit on a bench by Lake of the Isles and she would read Edgar Allen Poe stories to me. It makes me glad to know so many people loved her. Thank you Bruce. I am from Weagamow Lake, my father forwarded this to me. That is my grandmother in the picture, Mamie. My father married her daughter Eva. He was an anthropologist in Weagamow as well. Very grateful for the picture. Last night I received an email with this attachment. I have been trying to contact Mary but I was unsuccessful. I informed my mother this morning to let her know what happened. We had hoped we would see her again. If it wasn’t for Mary my art would never been by the outside world. I hoping I can contact Elaine and her family with this note. Me and Gary Q have been talking about writing about adventures with Mary. Thinking of you during this difficult time and may you find comfort in knowing Mary had many Friends and was always good to us. I vividly remember Mary Black. She came to Ponemah, MN when I was a young girl. She interviewed my father, Thomas Cain, who was brillant and knew a lot about our Native culture plus being fluent in both English & Ojibwe. Mary spent countless hours at our house speaking to my Dad. I will never forget her. She was a fantastic, respectful and smart woman. Mary was my Pepin cousin – our grandparents were brother and sister. I met Mary in the late 70s when we started our correspondence and shared family papers and photographs. She was a lifetime member of the Little Canada Historical Society which benefited by her knowledge of the fur trade and her genealogical research. I will miss her. Thank you, Bruce, for the lovely write-up about Aunt Mary. I enjoyed learning about her work and am embarrassed to say that I was not very familiar with it before reading your tribute to her. She was my aunt who taught me how to eat spaghetti and made marvelous hand-made dolls for me on Christmas. I do remember her talking about the people she worked with, though, and I especially remember Saul and Gary (my pen-pal) who came to visit us many years ago, along with Aunt Mary. I remember Saul’s artwork and am very pleased to hear of his success. (show me more, Saul. I am on Facebook). I am heartened to know that Aunt Mary was loved by so many and that she had such a positive impact on those around her. What a treat to see this remembrance of Mary. My first contact was reading her dissertation, and it was somewhat like her – not an easy read, but full of good thinking, and some surprises. I knew Ed for years before, and over the years they were around McMaster, we felt the obvious love they had for each other. Lives that were lived well. Yes, thank you for this wonderful overview of Mary’s life. She also resided in Edmonton, Alberta for many years. So, when I lived there as a PhD student in the Dept. of Anthropology at the University of Alberta, I was glad for the opportunity to meet THE Mary Black-Rogers, whose work I had read and appreciated. We had several things in common including working with and befriending Ojibwe speakers from NW Ontario and researching Metis family histories. She had donated much of her and Ed Roger’s research materials to create a U. of Alberta archive, which she worked on tirelessly for several years. Even at age 86, she was still working on presentations and papers – an amazing scholar. I had lost touch with her more recently but hope that her last days were spent with her family. Miigwetch Mary for your inspiration. Thank you, Bruce, for this wonderful tribute to my Aunt Mary Rose. When I was growing up, she was my favorite relative just because her life was so interesting and she was so intrepid. I still remember a big book about language that she gave me when I was in grade school and that I dipped into repeatedly over many years. I had lost track of Mary some time after she moved to Edmonton. I worked as a research assistant for Mary on two SSHRC grants over six years in Burlington. I, although an historian, learned so much in that time! Every time I read the stunning account of Mary’s life that you loving wrote, I am very grateful that Mary had you for a friend and colleague.